Is anyone else as happy as I am about being more than halfway through February? I really do strive to live in the moment, carpe diem, and appreciate the time that I've been given and all that. I do, I swear. I strive to do all of that while also plowing through the months of January and February like a bull in a china cabinet. I know it's been 80 degrees and sunny in Houston, I KNOW. But let me just say, I'm happy that March is almost here! You know what else makes me happy? Happy Hours, to be specific. And Houston has no shortage of exceptionally awesome food and drink HHs at local bars and restaurants! 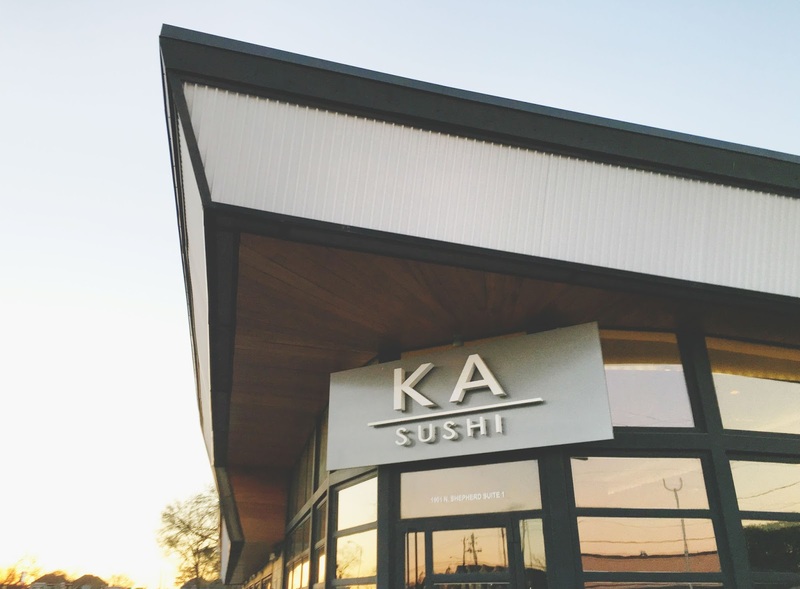 Last week, Jon and I met up with our friends Dan and Heather at Ka Sushi, a new(ish) restaurant located in Houston's Heights neighborhood. They have a great Happy Hour from 5:00-6:30, which entails an exhaustive menu of food and drink specials. We were sure to arrive in time to enjoy a few HH items before delving into the dinner menu! For drinks, I ordered a sake and a beer since it was Tuesday? (help.) 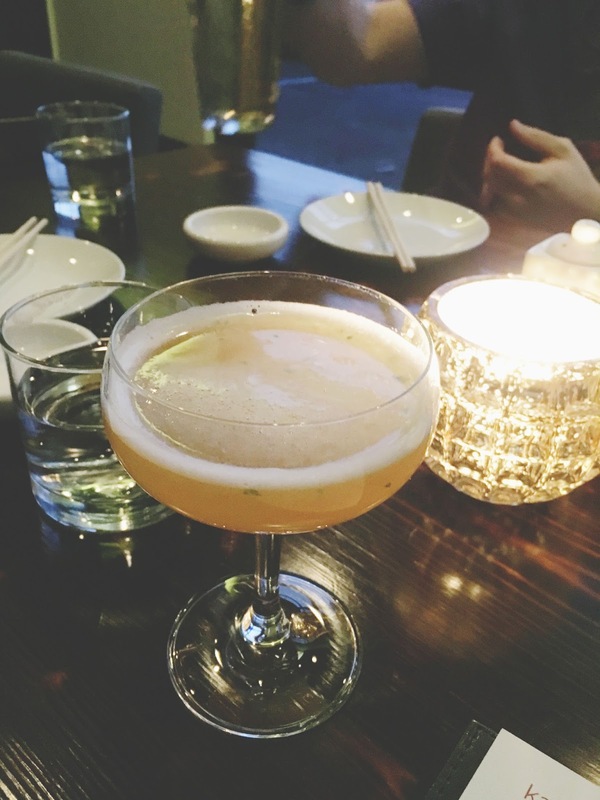 And Heather ordered one of the restaurant's signature cocktails, the peach greentini. She was kind enough to offer me a sip of this concoction of ciroc peach, fruitlab jasmine liqueur, peaches, and mint. The drink was refreshing, frothy, light, sweet, and definitely peachy! 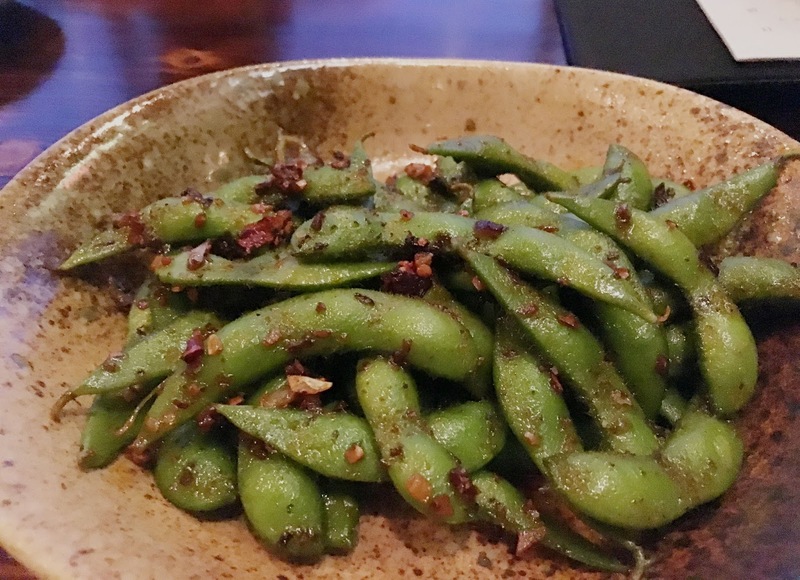 Jon can't go to a Japanese restaurant and not order edamame, so for our first round of food we ordered the spicy edamame from the Happy Hour menu. 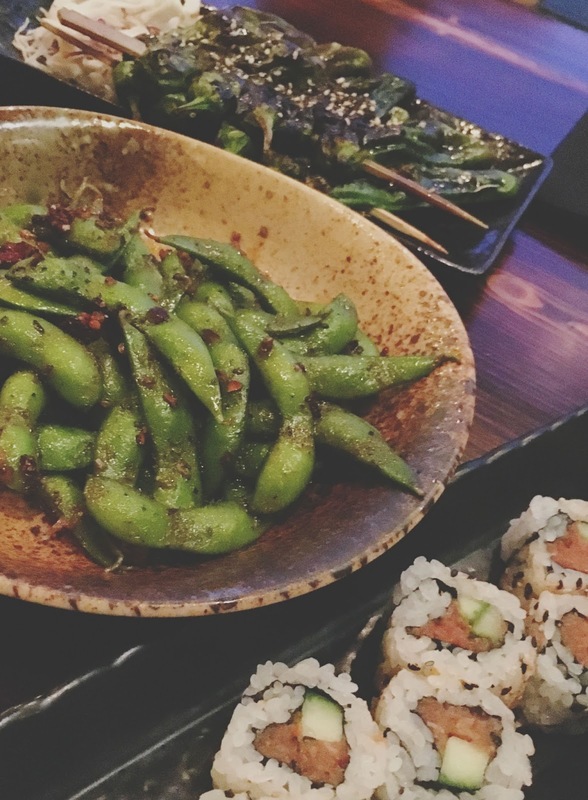 The spicy edamame dish lived up to it's name in that it packed some serious heat! The pods were sauteed and smothered in a smooth spicy chili oil, which gave them a more tender, soft feel. We definitely enjoyed this dish, and it definitely cleared out our sinuses! Another food item we ordered from Ka's Happy Hour menu was a plate of shishito peppers (not pictured). Coated in a soy glaze and topped off with sesame seeds, the smokey, sometimes spicy, skewered peppers had a sweet finish. It was a very nice, simple combination of flavors. Because if brussels sprouts are on a menu, I can't not order them. Ka's brussels were marinated in balsamic vinegar and tossed with fried leeks. Heather was a big fan of these because they were on the crispier side. 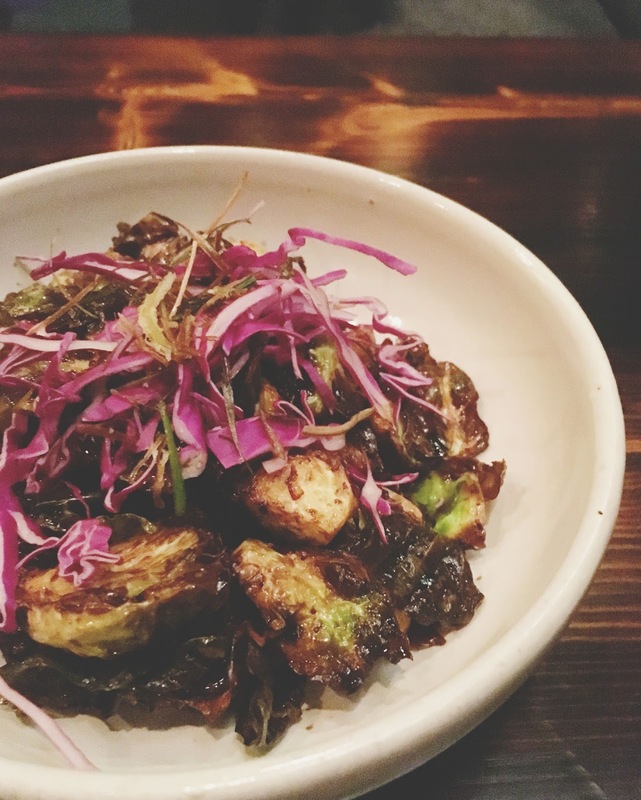 I appreciated the crunchy textures of the brussels with the leeks and fresh red cabbage, but I thought the flavor was a tad bland. I did enjoy them - because texturally, they really were awesome - however I would have appreciated a little more of a contrasting sweet element. We then ordered the restaurant's tomorokoshi. This beautifully presented ball of sweet corn with dashi cream and lime chili reminded me quite a bit of Mexican street corn. Once again I enjoyed the textures in this food item, but I wanted a little more from the flavors. After that, I ordered the green tea soba noodles. This was by far one of the most unique dishes of the evening. 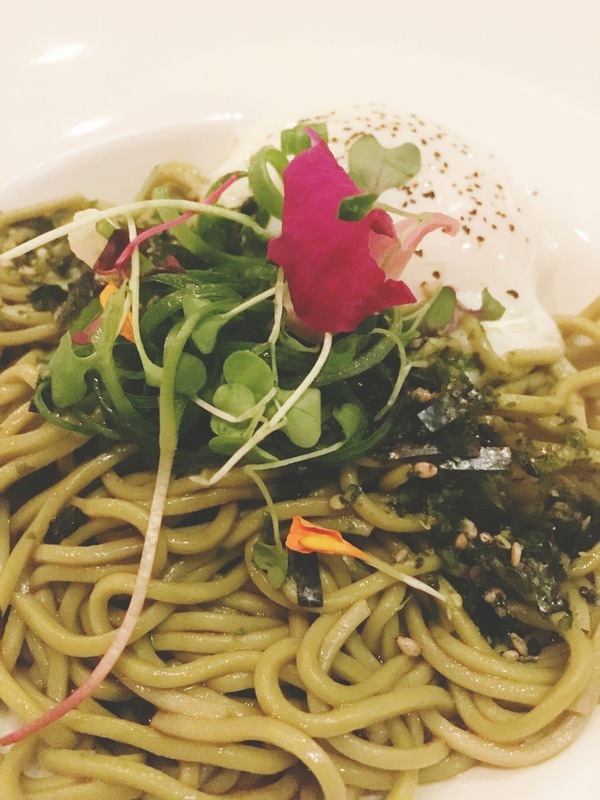 Chilled green tea soba noodles (talk about an earthy, different taste!) were tossed with dashi soy and furikake (I explained to our server that I was a vegetarian and didn't eat fish, so I don't think there was any fish in it...) and topped with an oozing, ready-to-burst, poached egg. Once I broke the yolk and swirled everything together, the result was a fascinating flavor experience. At the time I knew I liked it, but I didn't realize how much I really appreciated it. However, days later I found myself haunted by this unusual (for me anyway) dish, and grateful to have tried it! My favorite thing that I ate on that fine Houston evening was the miso eggplant. 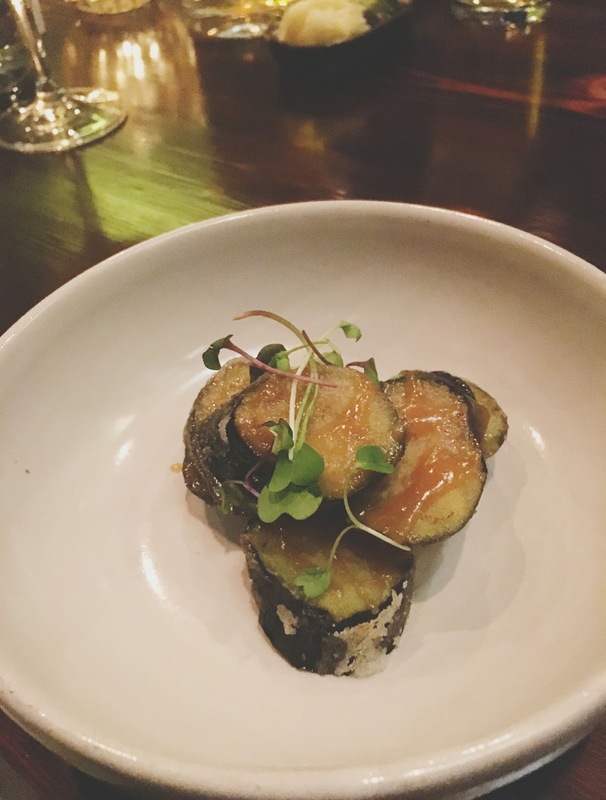 Ever-so-slightly-crispy eggplant medallions were lightly drizzled with a sweet miso glaze, and they were absolutely outstanding. The eggplant maintained a soft interior, which contrasted nicely with the crisped exterior. The presentation was beautiful and simple, and the end result was a wonderful marriage of just a couple of subtle flavors. I LOVED this dish. Finally, I tried the restaurant's sweet potato roll. This was probably my second favorite dish of the evening. 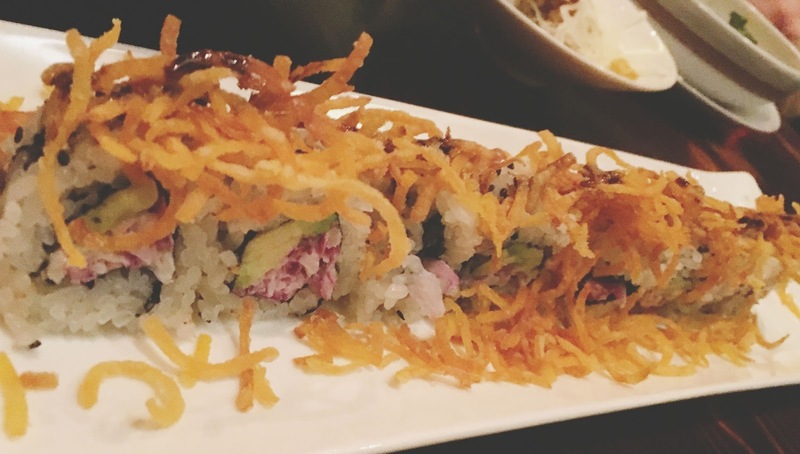 Topped off with crispy sweet potato, the roll was a combination of red cabbage, ginger apple slaw, avocado, balsamic, kewpie mayo, and sesame seeds. Once again, I experienced a fantastic flavor combination between the slaw, the mayo, and the crispy potatoes. And once again, the flavors were subtle but interesting, and created a nice contrast against one another and ultimate union together. 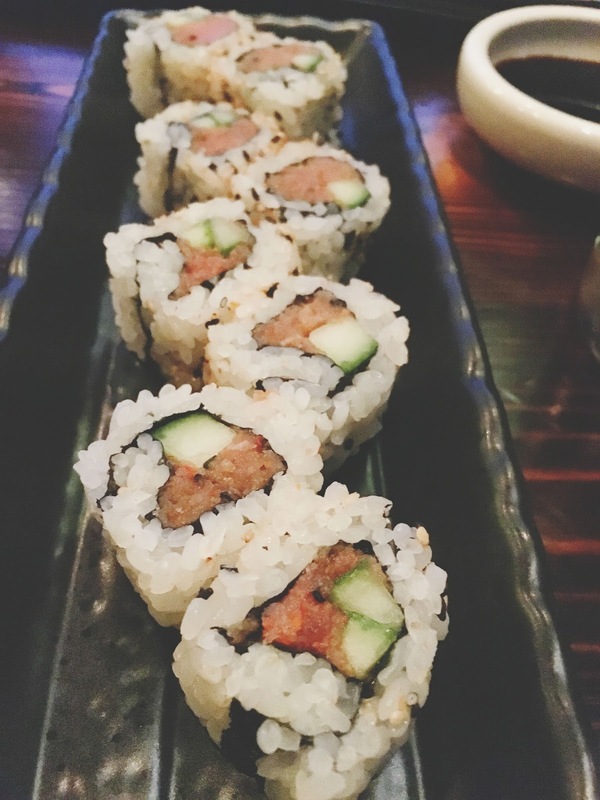 Ka Sushi is a great new(ish) addition to the already awesome Houston Japanese restaurant scene. I was impressed with almost every item I tried that evening. 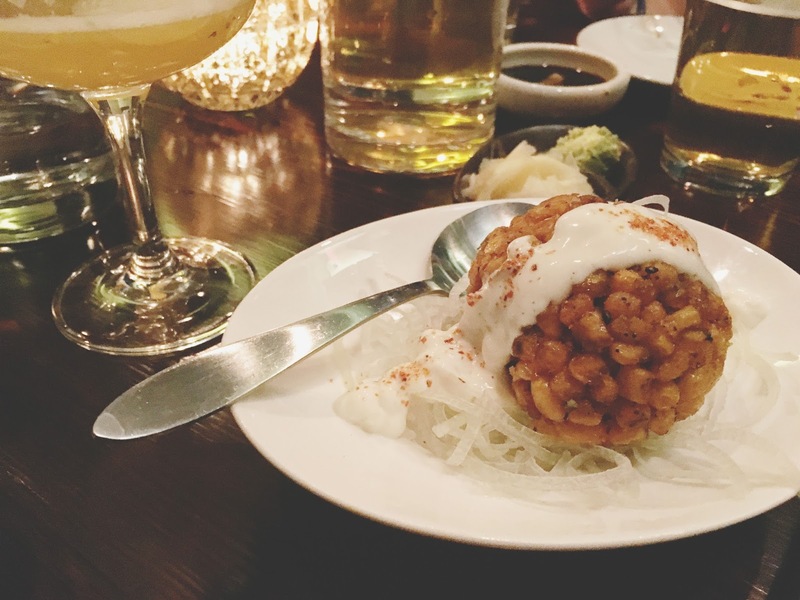 While your standard dishes are available, the restaurant has several unique offerings that will take you outside of the box, even in an already diverse food city like Houston. To top it off, they offer a comprehensive and affordable food and drink Happy Hour menu. As a frequent Houston Happy Hour-er, I'm definitely a fan of that! I've been seeing mentions of this restaurant everywhere, so it's obviously I sign I should not wait a day later to visit. And I'm totally with you on the January and February thing. What's even the point of them!? Yes, you definitely should go, especially for Happy Hour! Haha, winter is the pits, right?